We have many fond memories of the time God has blessed us with our little girl. I can’t believe that I was once ready to get rid of her because she refused to be housebroken. She was almost a year old and she just wasn’t getting it. I told her, “If you don’t stop doing your business inside the house by the end of the week, you’re out of here!” I don’t know if she understood, but from that day on, we had no more problems. When I think of what we would have missed out on had I followed through on my threat, I just thank God that she got the message. As I ponder what lies ahead for us – will she pass quietly in her sleep? – will we have to watch her waste away slowly because she refuses to eat? – will we have to put her down and hold her as her life leaves her tiny body? – I wonder, why does God allow us to love these little creatures so deeply that our hearts ache when we lose them? I think, “They are just animals.” But are they just animals? Anyone who has ever loved a dog knows that each one has their own personality. They can’t talk to us in human language, but they do communicate. We know what they are thinking and what they want, and they know how to get what they want from us. And when we talk to them, they listen, and it is almost as if they understand. When we are happy, they are happy. When we are down, they seem to know, and they will wrap themselves up next to us, or crawl up on our laps to comfort us. Remember the story of Lazarus and the rich man in Luke 16:19-31? The rich man had no concern for the plight of the poor beggar camped outside his gates. Jesus noted that the dogs had more compassion for this poor wretch and “came and licked his sores” (v. 21). Dogs are like that. I hope that God has a special place for dogs in heaven. I know that the Bible doesn’t talk about such things. Isaiah speaks of animals in the Millennial Kingdom: “The wolf also shall dwell with the lamb, and the leopard shall lie down with the kid; and the calf and the young lion and the fatling together; and a little child shall lead them. And the cow and the bear shall feed; their young ones shall lie down together: and the lion shall eat straw like the ox. And the sucking child shall play on the hole of the asp, and the weaned child shall put his hand on the cockatrice’ [crocodile’s] den. They shall not hurt nor destroy in all my holy mountain: for the earth shall be full of the knowledge of the LORD, as the waters cover the sea” (Isaiah 11:7-9). Since the wolf is of the “dog kind,” surely domestic dogs will be included there too. The Millennial Kingdom, although it will be wonderful, is not quite heaven. There is yet a New Heaven and a New Earth to be created (Revelation 21:1). There is no mention of animals in the New Heaven and the New Earth, but it is safe to guess that since God created animals before man in His first creation, then He probably will have animals in the New Heaven and New Earth. But do dogs go to heaven? In the beginning when God created, there was no death. Animals did not die and man did not die. It stands to reason, therefore, that animals too were created to live forever. But that ended when man sinned in the Garden (Genesis 3), and death entered into the world because of man’s sin (Romans 5:12). Man’s sin brought death upon all of God’s creation so “that the whole creation groaneth and travaileth in pain together until now” (Romans 8:22). Animals suffer death innocently because of our sin, but Jesus did not come to die for dogs. “This is a faithful saying, and worthy of all acceptation, that Christ Jesus came into the world to save sinners; of whom I am chief” (1 Timothy 1:15). In redeeming mankind, Christ will redeem His creation. “And God shall wipe away all tears from their eyes; and there shall be no more death, neither sorrow, nor crying, neither shall there be any more pain: for the former things are passed away” (Revelation 21:4). No, the Bible doesn’t say what happens to doggies when they die. That does not mean that God does not care about them. Our beginning verse reminds us that even seemingly insignificant sparrows do not fall without their Creator taking notice of them. So, as I pray for my little four-footed friend, I ask that God will take note of her. Remember what a faithful little companion she has been. Remember that the curse of death is not her fault; it’s mine. 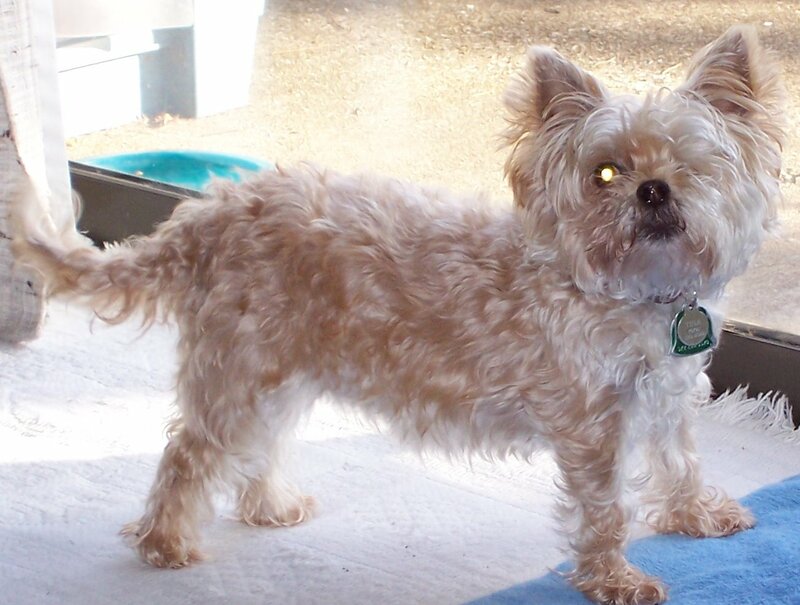 So, if there is a doggie heaven, then please, Lord, make a place for our little Tina. Ernie and June — Me, Destiny and Cassidy will keep ya’ll in our prayers. Keep us posted. You already know I am a “dog lady”, they are the embodiment of unconditional love. Just think, if our dogs can love us no matter how good or maybe not-so-good we are, think just how much our Creator God loves us! Even more than our furry ones. I know the final days, hours, or ever how much time Tina has left will be precious to you both. You’ve been good pack leaders! I seem to remember C.S. Lewis defending the idea that animals will be preserved by God. Really, it is hard to imagine God not loving all of his creation enough to preserve it, down to every individual creature, in the New Heavens and New Earth. To suggest otherwise strikes me as poor theology.